At long last, a clear and practical book by an internationally recognized clinician who creates a sound diet as the cornerstone of a healthy lifestyle. There are no gimmicks, quick fixes, or misleading before and after photos since this diet is based on the latest science which underlies all effective weight management. If you are going to read and use only one book on diet and lifestyle, this is the one! Are you desperate to feel better but don’t know where to begin? Has your doctor prescribed a quick fix pill, but no solid game plan? This is your lucky day. Dr. Mark Hyman’s revolutionary work has the power to radically transform and uplift your life. He is the shining, break-out voice of a new breed of functional medicine doctors who treat root causes rather than symptoms. Let Mark be your guide and your teacher as you create a happy, healthy body filled with sustainable energy and balance. I can’t say enough about this brilliant pioneer, and once you read his book, I know you will agree. Dr. Hyman has taken on the most important health issue not just in the United States but around most of the world—diabesity. And, as usual, he has performed a great service, this time by providing a blueprint for attacking diabesity for individuals struggling with its complications and for the larger community, where it is a major economic as well as major health problem. Rare, indeed, is the individual who combines scientific expertise, deep caring, and equally deep insights. Dr. Hyman is one of these, and in addition, as a leader in functional medicine, has a unique ability to see past the many adverse effects of a lifestyle at odds with health to the underlying causes both within and all around us. He puts all of these attributes to work for you in The Blood Sugar Solution, providing detailed guidance for both individuals and the population to avoid the perils of obesity and chronic disease—and get to health. Diabesity is no longer a hidden epidemic—it’s visually obvious all over North America and the primary driver of ill health and out-of-control healthcare costs. Dr. Hyman once again nails the problems and provides real solutions. In The Blood Sugar Solution, Mark Hyman maps a road to health that will benefit anyone. Read it for yourself, your family, your friends. Give this book to the people you love. With our world facing multiple crises, including a dramatic rise in diabetes, The Blood Sugar Solution arrives not a minute too soon. Dr. Mark Hyman’s insistence on identifying the root social causes of obesity and diabetes is a crucial step beyond many of our long-held assumptions and in the direction of real solutions. Our children deserve nothing less. 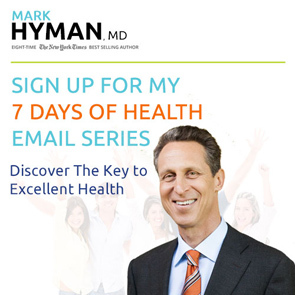 Dr. Mark Hyman makes managing your health simpler than you ever thought possible. There’s no time like the present to get started. Don’t wait till tomorrow! Start today! First, the bad news: Type 2 diabetes and pre-diabetes will affect half of Americans in the next few years. Drugs are not very effective at preventing the complications of diabetes, including heart disease, blindness, impotence, amputations, and kidney damage. Now, the good news: diabetes is completely preventable and even reversible for most people–today–simply by changing diet and lifestyle. In The Blood Sugar Solution, Dr. Mark Hyman shows you how. With compassion and authority, Dr. Mark Hyman addresses the real driver of overeating, obesity, diabetes, heart disease, cancer, and more—insulin. Insulin imbalance, the secret killer, robs millions of a rich, joyful, happy life. If you have struggled with weight and ill health, you will find a new doorway to wellness through his solid science-based, personalized solution. Dr. Hyman has done it again with a lucid description of the causes of the diabesity epidemic and a powerful treatment program. The Blood Sugar Solution is a must-read for anyone anywhere on the spectrum between mild insulin resistance and full-blown Type-2 diabetes–a groundbreaking, science-based, easy-to-follow prescription. Start your journey to healing now! In the last decade, the rise of obesity and diabetes has emerged as a crisis that threatens our families, the global economy, and the success of our next generation. I’ve made drastic changes to my own diet and exercise routine since my heart troubles surfaced in 2004 and I hope Dr. Hyman’s new book will inspire you as he has inspired me.